My mother’s response: “Good.” Her one word beat my two every time. “Good” could mean that I was about to help her shuck corn or do the dishes. Or it could mean that I was going to have to think of something new to do. Maybe it was after such an exchange that I first canoed into the swamp or made a fort in the woods or worked up the courage to meet the kids two cottages down. 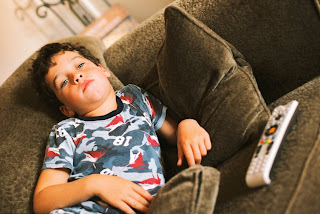 Now it’s my turn to see a frowning child flop onto the couch and announce, “I’m bored.” I’ve noticed that I often hear it, usually from Virgil, within minutes of returning from having been somewhere or after he’s spent time online or watching a video. I’m surprised by how quickly he seems to fall into boredom. Turn off the TV. And the computer. And the video games. Find a balance between adult direction and child boredom. If a child’s days are heavily scheduled, parents may need to schedule “unstructured time” to make room for creative boredom. Thinking back over the last week, I can identify times that I followed Louv’s advice, like when I asked Virgil to pick me some mint from the backyard to make mint tea or played a game with him before sending him outside. And of course, I still have my mother’s one-word mantra at the ready. Find more ideas for encouraging “constructive boredom” on the Children & Nature Network. Richard Louv is the chairman of the non-profit network, which supports people and organizations working to reconnect children with nature.